MXR, also known as MXR Innovations, was a Rochester, New York-based manufacturer of effects pedals, co-founded in 1972 by Keith Barr and Terry Sherwood  and incorporated as MXR Innovations, Inc. in 1974. The MXR trademark is now owned by Jim Dunlop, which continues to produce the original effects units along with new additions to the line. MXR co-founders Terry Sherwood and Keith Barr met as high school students at Rush-Henrietta Senior High School in Rochester, New York. Together they started Audio Services, an audio repair business, where they repaired stereos and other music equipment in their rented basement apartment. This experience led them to form MXR and begin producing their first original effect pedal design, the Phase 90, quickly followed by the Distortion Plus, Dynacomp, and the Blue Box. Michael Laiacona joined this early MXR team in the key role of sales. Barr later left MXR and went on to found Alesis, Sherwood co-founded Applied Research & Technology, and Laiacona went on to found Whirlwind USA. Jim Dunlop acquired the MXR brand in 1987 and continues the traditional pedal line of original MXR classics that have come to define the brand, such as the Phase 90 and Dyna Comp, as well as modern pedals like the Carbon Copy and Fullbore Metal. Dunlop has also added a line dedicated to bass effects boxes, MXR Bass Innovations, which has recently released the Bass Octave Deluxe and Bass Envelope Filter. Both pedals won Editor Awards in Bass Player Magazine and Platinum Awards from Guitar World Magazine. The MXR Custom Shop is responsible for recreations of vintage models such as the hand-wired Phase 45, as well as doing limited runs of pedals featuring premium components and highly modified designs such as the new Custom Comp. 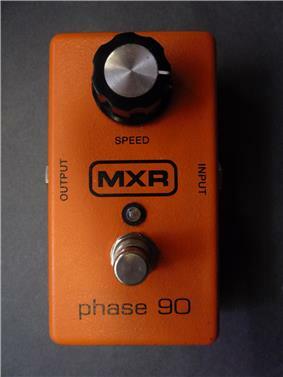 The first MXR effects pedal was the M-101 MXR Phase 90 phaser. The Phase 90 was used on the first two Van Halen albums. The MXR Phase 45, a milder version of the Phase 90, was also released, as well as a programmable version, the Phase 100. Like many other pedals of the day, MXR pedals (prior to 1981) did not have LEDs, A/C adaptor jacks, or true-bypass switching. Over the years, there were two distinct periods that the reference series pedals went through. The first period is now known as the "Script period," in reference to the cursive writing on the pedal’s casing. The earliest script logo pedals were actually made in the basement shop of the founders of MXR and the logos were silk screened by hand. These very first pedals can be identified by a slightly larger font “MXR" on the case. The "Box Logo Period 1" began around 1975-6 and lasted until 1981, and is named for the writing on the front of the box. The “Box logo period 2" started in early 1981 and went until 1984, when the company stopped making pedals. The main change in this era was the addition of LEDs and A/C adaptor jacks. These pedals used 1/8" power jacks and had exactly the same circuit board as their pre-1981 box logo brothers. In 1981, MXR introduced a line of inexpensive plastic ("Lexan" polycarbonate) pedals known as the Commande Series. 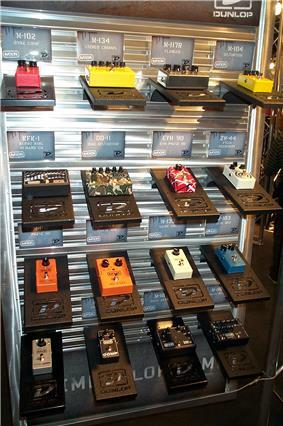 These were priced to compete with the Japanese-manufactured effects pedals that were flooding the US and world markets. These were a departure from the Reference Series in several aspects. The input, output and power jacks were all moved to the top of the case to allow a tighter grouping on the floor, or pedal board. Also, for the first time, MXR incorporated a large footswitch. The MXR Series 2000 sported six models. These original pedals in the series included the Dyna Comp, Distortion +, Phaser, Stereo Chorus, Stereo Flanger and Time Delay. In late 1983 MXR announced a digital sound effects pedal generator simply known as the ‘’Junior’’. The Junior was released in early 1984 and was added to the other six pedals in the Series 2000 line. The Junior boasted four sound effects: a laser, a clap, a snare and a high hat. These sound effects or samples were written on a large 24-pin ROM chip that was produced by MXR. The ROM chip had to be inserted into the circuit in order for the sounds to register. MXR continued to manufacture most of the Reference, Commande and 2000 Series pedals until they closed their doors in 1984. MXR also had a line of professional rackmount effects used by the likes of David Gilmour, Stuart Adamson and Mike Rutherford. In 1983, MXR introduced one of the first multi-effect rack units for guitar and bass, the Omni. The Omni had 6 different effects: sustain, distortion, delay, equalization, flanger and chorus. The main unit was a 2U with separate controls for each effect. There was a footpedal (M-181) that enabled the player to switch the different effects on and off, as well as changing the order of the distortion and equalizer effects, a master bypass as well as an effects loop. MXR produced a line of processors targeted for home entertainment systems of the day. Most of these items came with wooden (walnut) side panels. The larger 17” wide units also had kits available for single or 1U (M-145 Single 1.75” Rack mount kit) and 2U (M-146 Double 3.5” Rack mount kits) available. In late 1981, MXR got the resale rights in the US to sell the KIT (M-178), a digital drum machine. In early 1983, MXR released the M-185  MXR Drum Computer, followed by the Drum Machine II (M-189). These were all similar to Roger Linn's Linn LM-1 drum machine. Jim Dunlop (the company famous for the Cry Baby Wah-Wah) bought the MXR licensing rights and currently manufactures reissues of some of the classic MXR effects pedals. Dunlop has created new models in addition to the original lineup, including signature pedals such as Eddie Van Halen Phase 90 and Flanger, and Zakk Wylde's Wylde Overdrive and Black Label Chorus. ^ "Eddie Van Halen's Rig and Tone Techniques". 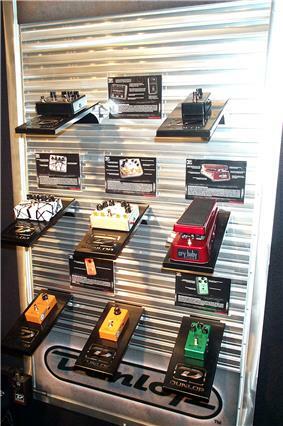 ^ "Current MXR Pedals Catalog".